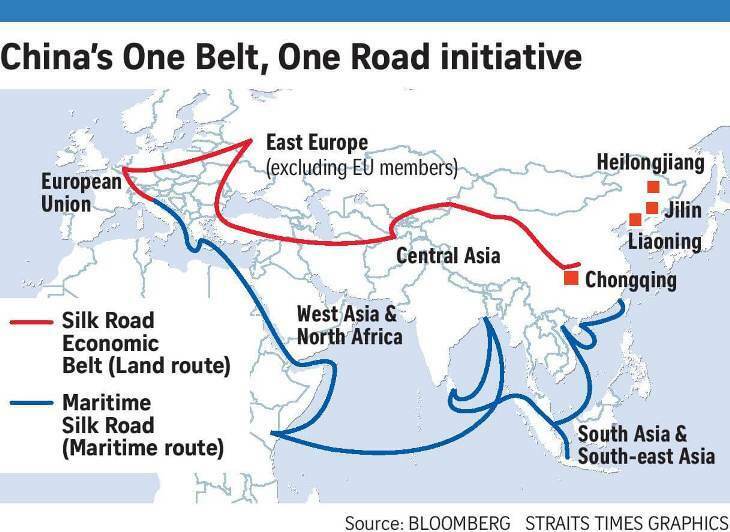 (TibetanReview.net, Jul25, 2017) – China said Jul 23 that India’s antipathy towards its so-called “Belt and Road”(B&R) initiative – involving creating of trade routes within and across countries with massive building of related infrastructure – may weaken its plans for Tibet and Nepal. India’s attitude toward the B&R is not conducive to Tibet’s involvement in the initiative, said a commentary carried by China’s official globaltimes.cn Jul 23. It said that among countries and regions along the route of the B&R, India was the only large economy that was yet to express public support for the initiative. It therefore felt that India was unlikely to consider building a railway linking it to the Tibet Autonomous Region (TAR). It also said that due to the fact that Sino-Indian border trade was underdeveloped, more than 90 percent of trade between India and the TAR, which border one another, passed through the port of Tianjin in North China, located 4,400 kilometers away. Noting that Tibet was close to South Asia, the commentary suggested that full use should be made of this unique advantage by boosting the local financial industry. And in its participation in the B&R initiative, Tibet must pay attention to connections to people in surrounding countries and regions, it said. The commentary also said Nepal’s former prime minister KP Sharma Oli had agreed to speed up interconnection and strengthen cooperation with China, but that “this process may be held up due to India’s attitude toward the B&R”. It also said Nepal’s internal politics may thwart the interconnection of the two countries’ infrastructure. It noted that the Himalayan country had misgivings about ramping up efforts to carry out the agreement reached by Oli “who had a pro-China stance”. Besides, China hopes that Nepal can serve as a bridge to India, which means that China needs to speed up interconnection with Nepal first, the commentary said. Given the lack of cooperation from India, the commentary suggested that further economic integration between the TAR and the rest of the PRC would enable the region to play a more active role in the B&R initiative. It said that China should create a favorable international environment for itself to speed up the interconnection with South Asian countries and make the TAR a bridgehead for that process. Given the lack of interest in India’s central government in the B&R initiative, the commentary suggested that while setting the stage for strategic interaction with India, China should focus on cooperation with the state governments of India and major companies there.